Every slice of fruit pie needs a scoop of cold ice cream, so as I thought about the blueberry pie I was going to make for Jamie last weekend, I decided to make homemade ice cream to go along with it. 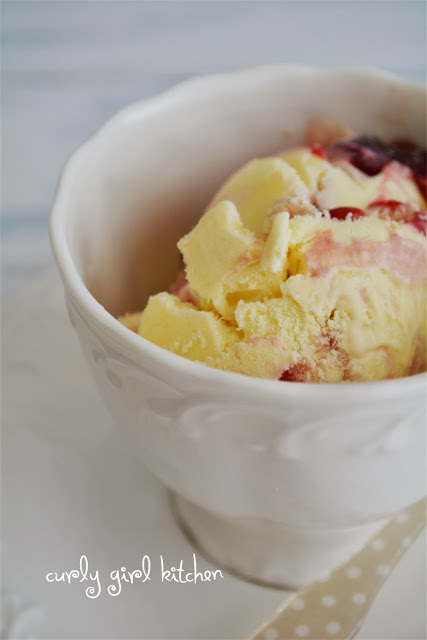 There were a few ice cream flavors that my dad routinely bought when I was a kid, a lemon sorbet and a raspberry blueberry swirl ice cream he really liked, until, to his disappointment, they discontinued the flavor. 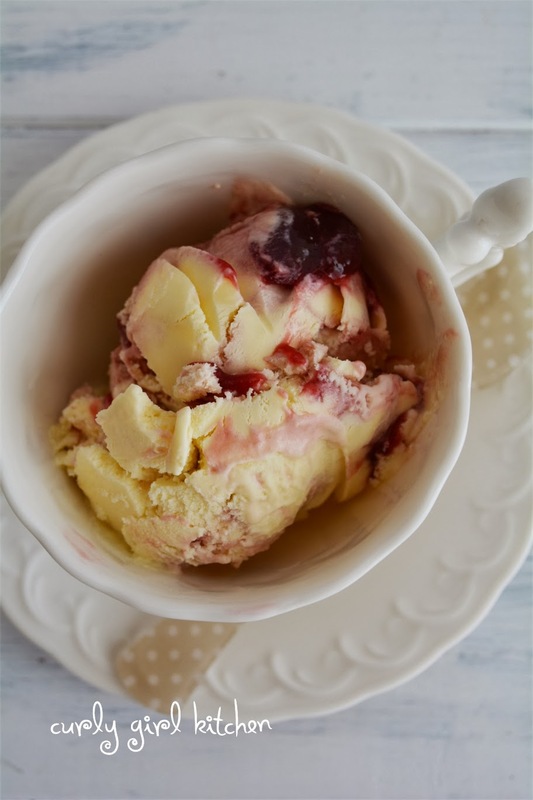 He has always liked the fruity ice creams, while my mom loves the decadent, fudgey chocolate, nutty, espresso bean, full of chunks of deliciousness varieties, so they have a hard time agreeing on what to stock their freezer with. 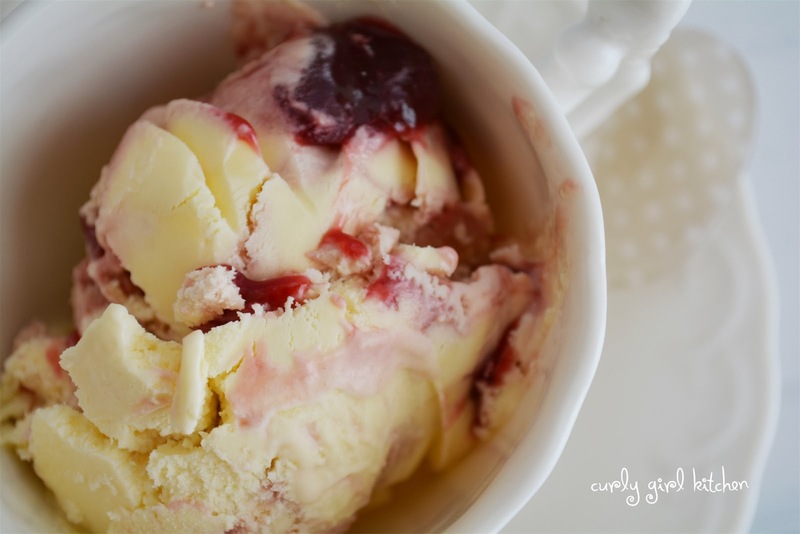 So to eat with the blueberry pie, I made a raspberry swirl cheesecake ice cream which reminded me quite a bit of that favorite of my dad's, only better. 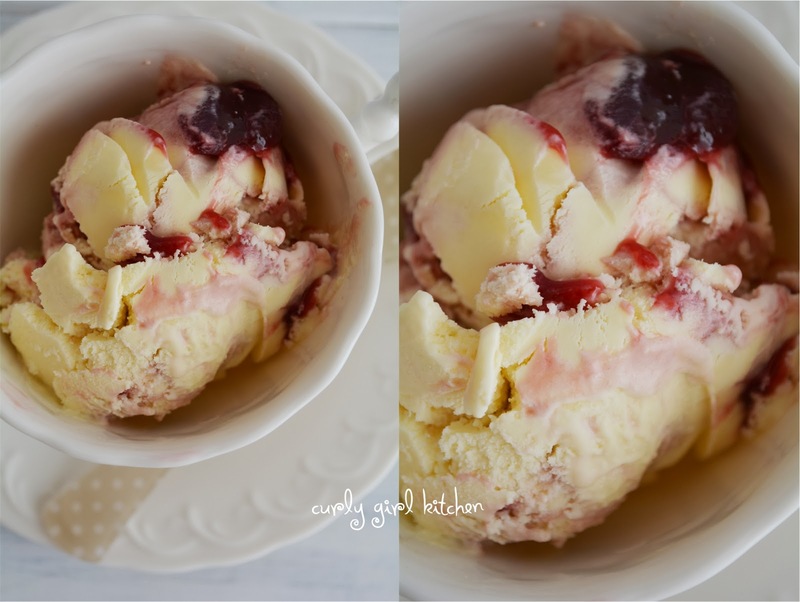 Creamy vanilla cheesecake ice cream, swirled with seedless raspberry jam, it was smooth and rich with a nice tartness from the jam. On Saturday when it was almost dark, Jamie came upstairs from working on his car, tired and hungry. I had baked the pie that morning, and it sat temptingly on the counter, the scent of blueberries, butter, cinnamon and sugar wafting through the house. He leaned over the pie and stared at it longingly. "Should we just have pie and ice cream for dinner tonight?" Pour the cream into a saucepan. Bring to a gentle simmer over medium heat. In a bowl, whisk together the egg yolks and sugar. Whisk 1 cup of the hot cream into the egg yolks, then scrape the eggs into the saucepan. Cook the custard over medium heat, whisking constantly, until the custard thickens enough to coat the back of a spoon. Pour through a mesh strainer to strain out any bits of cooked egg. With an electric mixer, beat the cream cheese and vanilla until smooth. Gradually beat in the hot custard, mixing until very smooth. Pour into a bowl, cover with plastic wrap resting against the surface of the custard, and chill overnight. 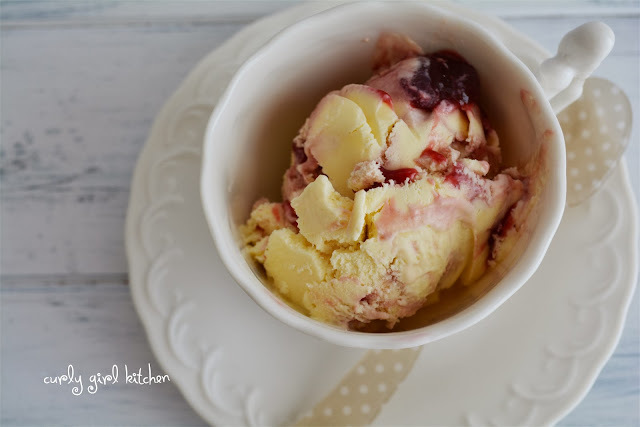 Churn the custard in your ice cream maker according to the manufacturer's instructions. When the ice cream is soft-serve consistency, spread into a container. 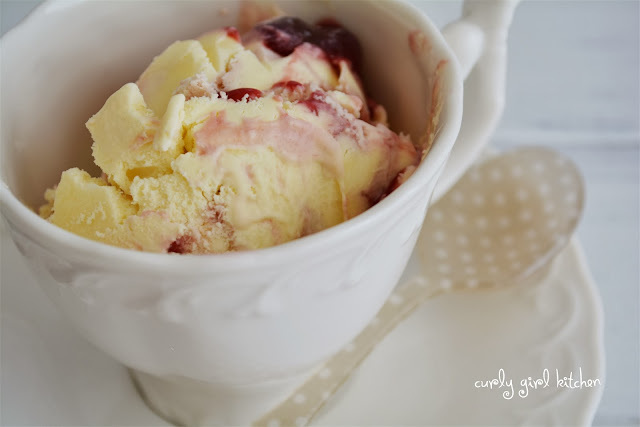 Dollop with the raspberry jam and swirl into the ice cream. Freeze until firm, about 4-6 hours. Such a sweet memory. I read it out loud to Dad and it made me cry. We love you both.